In 2016, Helen Love, a ceramics technician at Grays School of Art and Glass, was commissioned by Aberdeen Art Gallery to create an original installation for their reopening. Using traditional ingredients of minerals, clays and metal oxides, she created almost five hundred ceramic test tiles covering the full spectrum and using only natural minerals, clays and metal oxides. For more than two years she did this, collecting a vast amount of data that she wanted to share with the wider world. In September 2018, to assist her in funding the research, she set up an online fundraiser campaign. Collaborating with creative agency Design and Code, the intention was to transform her installation into an interactive website, 'The Glaze Spectrum: A Digital Library', where anyone could access the data and glaze recipes. Using eight metal oxides to create a vast spectrum of colours, the resource could become an invaluable tool for learning about the foundations of ceramic glazes. For the more advanced users, it would be a place to compare glaze features such as colours and certain firings. On Instagram followers have been tracking the progress of her project for a while now via @glazesprectrum, as well as on Twitter, and some of the results of her research were made public on the Design and Code Glaze Spectrum website recently. To say that Helen Love is passionate about glaze chemistry is an understatement, for sure. You can assist her in furthering her research into what she has termed an edu-clay-tional resource, by visiting her Gofundme page now and contributing a donation to carry the project forward. Already, mockups of this highly valuable resource have been made to illustrate just how useful it will become. For the non-chemists among us, the idea that Helen is able to create a searchable ceramic glaze-recipe database with all the colours of the rainbow represented, and from just eight metal oxides, probably sounds like some strange alchemy, indeed. Effectively, what she is producing is a collection on Pantone-like ceramic swatches with the recipe and firing required to replicate every colour, or, seen another way; from a web designers point of view, a ceramic version of every hexadecimal colour value available. It will be quite an achievement once the project goes live. 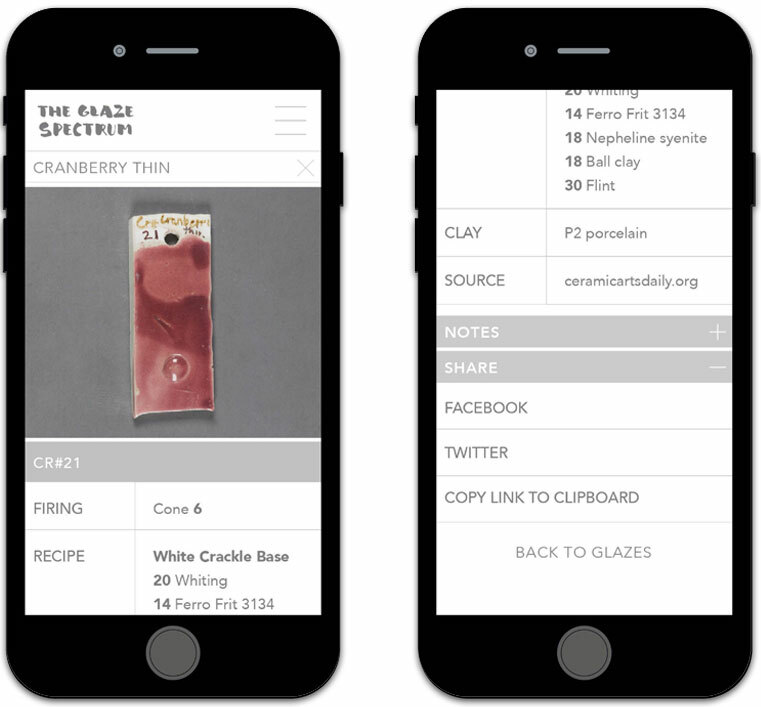 The Glaze Spectrum website mockups for mobile devices, here showing the search filter options to help ceramicists find glaze recipes and data on the open source application.